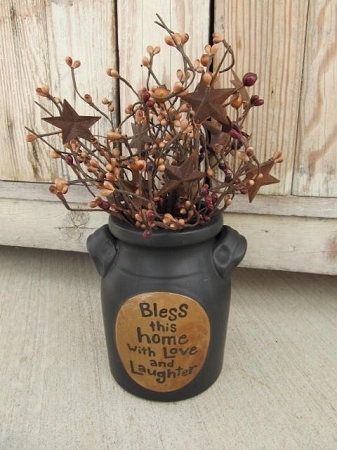 Primitive Black Stoneware Bless This Home with Love and Laughter Crock with Pip Berries. High quality stoneware piece. Love the saying...great accent piece for your home. Black colored stoneware with tan area for saying. I've filled the crock with coordinating pip berries in colors of Burgundy, black, tan and mustards with rusty metal barn stars. The crock has stoneware handles on each side. Size is 4 1/4" diameter by 6" tall and around 12" tall with berries. Only 1 in Stock and it's ready to ship!